Oh Pac, you've duped us once again. It turns out that disquieting hologram burning its way across Coachella and the entire internet wasn't an actual hologram at all: just a reflection using a 19th century magician's tricks. 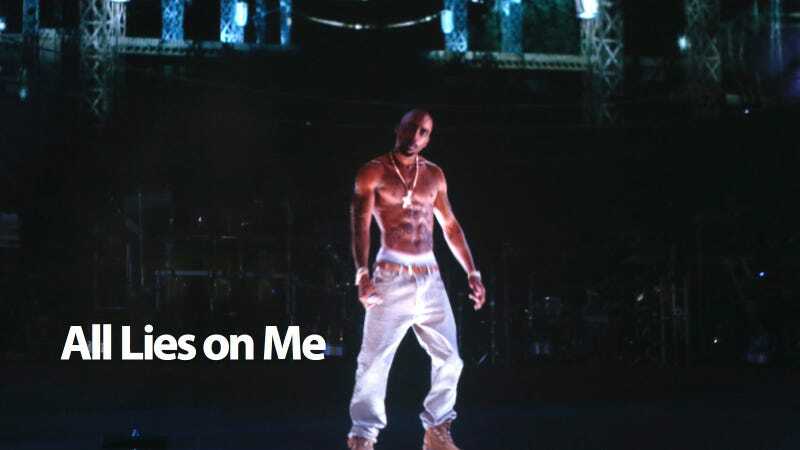 For those who thought the immaculately-chiseled rendition of Tupac was based on some sort of old footage, more disappointment: Rolling Stone reports the rapper was CGI. But at least it was good good, expensive CGI, "created by the Hollywood special effects studio Digital Domain, who have previously worked on films such as The Curious Case of Benjamin Button, TRON: Legacy and X-Men: First Class." Total price? Somewhere between $100,000 and $400,000. And it paid off: other than the weird super-abs, occasional unintentional moonwalking, and the performance's finale, wherein Tupac vanished in a burst of light, the whole thing was plenty realistic. With all the weed and ecstasy throbbing through Coachella, there were probably a good number of fans who thought they were actually witnessing a reincarnation. But that's just the image source—how did AV Concepts, the firm behind the display, actually project Pac on stage? It calls him a hologram, but hologram he is not: it's a fancy reflection technique called "Pepper's Ghost," named after a mid-19th century optics researcher John Pepper. Yep! 19th century. The trick is based on the fact that glass is both transparent and reflective, meaning it's possible, with the right angles, to bounce a picture off of it that appears to be floating in air. But it's not—it's just stuck on an expensive screen. Pac's totally 2D. It's an impressive show when done on a Coachella scale, but it's not Princess Leia action. 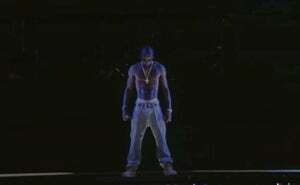 This might explain why AV Concepts and Dr. Dre's manager both refused to speak about the tech behind Tupac's exhumation until after this weekend's Coachella performances—where presumably more "holograms" will be trotted out. Fingers crossed for a George Harrison/Big L holo-mashup.